One thing I do have far too many of is cook books. Some are stained and the pages are stuck together whilst others look like they have come straight out of the book shop. I will say I don't buy many cook books myself and all the ones I'm getting rid of have been given to me either as a present or part of someone else's decluttering process. This all sounds terribly ungrateful but I've had these books for some time now and there are no recipes in them which I am inspired to make. It's time to make space in gleeful anticipation of new books arriving next month. So here's the list of the cook books that have been culled. By the look of the cover it seems we should all know who Tom Bridge is. I must have had this book about 15 years and I'm still none the wiser to who he is. Many of the recipes seem to require a huge cut of bovine, a quantity of his beef stock made with beef bones and red wine. All ingredients not often seen in my house. On the positive side my mother swears by his recipe for Beef Bourguignonne (his spelling not mine) and in particular the bouquet garni that goes in it. 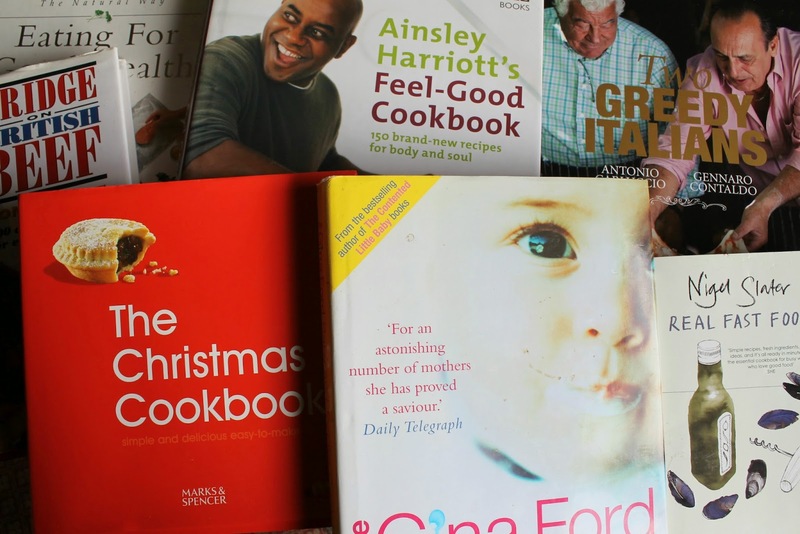 A collection of festive recipes complied by Marks and Spencer with no recognised author (boo!). Having been through many a Christmas meal now I've got the big day sorted – smoked salmon, duck or goose, Christmas Pudding. Move along now please! Many parents swear by Gina Ford others swear at her. Since my son is now four this has been somewhat redundant in my house for a long time now. It does have some good ideas in it but any cookbook that suggests you rustle up a roasted poussin for a 10 month to eat for lunch really does deserve a certain amount of incredulity. My tip – never trust a 'baby and childcare expert' who has never spent night after night trying to get a baby to sleep for more than two hours at time (this includes all health visitors and midwives). I know, I know, I know, I know, I know. Many people worship Mr Slater and hang onto every word he says. Even with my haphazard approach to meal planning I find his method of food shopping completely incompatible with my life as a mother of two young children living in the unfashionable suburbs of Sheffield. I don't deny there are a lot of recipes in this book but I don't need to be told how to make a fish finger sandwich made from shop bought frozen fish fingers or An Egg Sandwich (ingredients: 2 hard boiled eggs, 2 rounds of soft white sandwich loaf, butter, salt, black pepper; yes really that's it). My main gripe though is it looks more like a novel in its size and layout and doesn't contain a single photograph. When I was student Ainsley was regular chef on Ready, Steady, Cook which started a month after I began at university. He was a whizz at whipping up a tasty plate of food in less than 10 minutes with a random bag of ingredients. Since those heady days of afternoon TV he has written over a dozen cookbooks of which this one came out in 2006. There's nothing particularly offensive about this book but they are simply not the sort of recipes I think I would ever make. He does though deserve credit for having a page in the book entitled Feel-good cake therapy which also contains the mantra, 'A cake a day keeps the doctor away'. A lesson for life there. This book accompanies the BBC series of the same name. I really do like Italian food but, dare I say it, I find much of it very samey. There's a lot of recipes containing tomatoes and enough chopping of vegetables to keep Mama busy for most of the day. I never quite got this programme and if you're going on culinary tour give me Rick Stein any day. I have a major problem with Reader's Digest. When I was child they would hound my nan with constant competitions promising untold riches (these were pre-National Lottery days). All these letters would be sent by the dubiously named Tom Champagne. When you sent back the competition entries you had to put it in either a 'Yes' or 'No' envelope depending on whether you were going to buy their latest book. My nan was convinced that any 'No' envelopes would automatically be binned and often felt compelled to buy the over-priced book. This book is now nearly 20 years old and I'm sure any foods that were thought to be life-savers in the mid-nineties are probably deemed near fatal now. Are you having a pre-Christmas clearout? What cookbooks are never opened in your kitchen? Joining in with The List with You Baby Me Mummyand Mum's Days. Well done you! I am not a hoarder, but my cook books (and my CD's, DVD's and other books) are the hardest things to ditch. Shame on the minimalists for suggesting they should be got rid of. Mind you..... looking at your list above, I would probably have chosen similar if they were in my collection...... Mr Bridge looks decidedly dodgy!!!! That's not a good cover shot! I don't think I have ever got rid of a single CD! I think the Tom Bridge book suffered from being commissioned by British Beef. Books from marketing boards are never quite as natural. Look at the size of that rib of beef! Oh gosh, I bloody love this post! I'm a sucker for a cook book and would horde them forEVER but...I can't remember the last time I read some of them. The Bean Bible for example? I do like to have them though, they make me feel safe. What if the internet would die and I'd be left with a jerusalem artichoke and no idea what to do with it?! I also have that Nigel Slater Book and I like the fact he goes through a few ideas for different veg, but really I've never got further than using it for reference once a year. I'm not getting rid though. Obviously. I was given the Nigel Slater book by someone who had a clearout of their cookbooks. I noticed on the back it was a free edition from She magazine so I think that copy has not had much love! I have borrowed his Kitchen Diaries from the library and read them more like books but I do love a photograph in a cookbook!